On the Services page, click the Add New Service button. In the Add New Service dialog box, enter the appropriate settings, and then click Save. 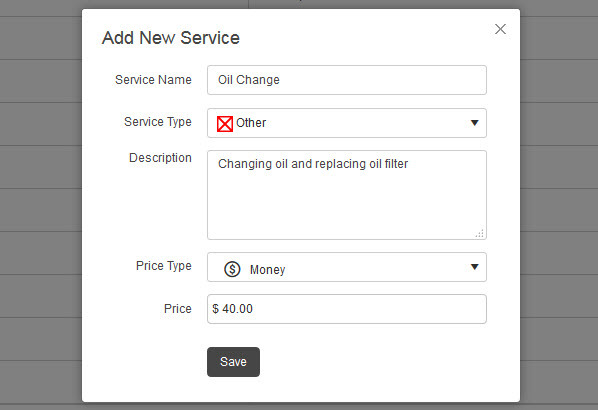 Service Type allows selecting one of available service types from the list that depends on your business line. Price Type allows selecting Money price type for repair services with fixed price, Labor price type for services with hourly rate, or Percentage price type for price adjustments like surcharges, discounts, and taxes. Note that you cannot change price type while editing an existing service. Price allows entering either money or percentage value based on selected price type.